Acroname sells the "R298-1T-SERVO", which is actually a GWS S125 1T/2BB. It's different from most servos in that you can tell it to set any angle from 0-360 degrees, whereas most ordinary servos only move 90-180 degrees. It has a 25-tooth spline, which should make it compatible with futaba arms. Pololu sells it under the correct part number. Tonight I got my Ubuntu Lucid machine to program a 3.3v Arduino Pro Mini using a 3.3v FTDI Basic USB->TTL serial interface, and then got them both to talk to a BlueSmirf bluetooth->TTL serial board. 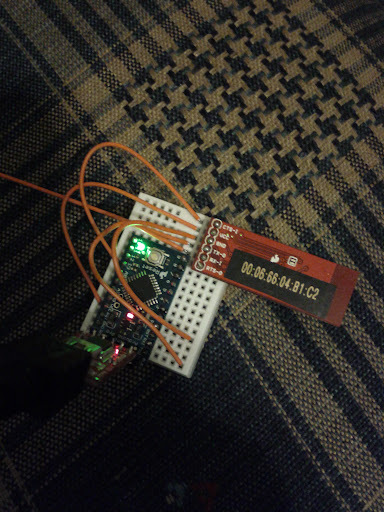 I ran minicom and connected to /dev/ttyUSB0, talking to the USB board and thus to the serial lines on the bluesmirf. This bluesmirf was set up to communicate at 57600 baud, which I had to find by trial and error. Once I got the right baud rate, typing "$$$" got me a "CMD" prompt as the manual suggests. I switched it over, so now it uses 115200 baud. I thought it was going to let me type to the bluetooth device, but really it's just creating /dev/rfcomm0 and then doing nothing. So with that command running in another window, I ran minicom and pointed it at /dev/rfcomm0, at which point I was able to type and see it in the other minicom window (pointed at /dev/ttyUSB0), and vice versa. So that's how I knew the bluesmirf board was working. Then I downloaded the 64-bit linux install from here: http://arduino.cc/en/Main/Software and unpacked it into a folder in my home directory. 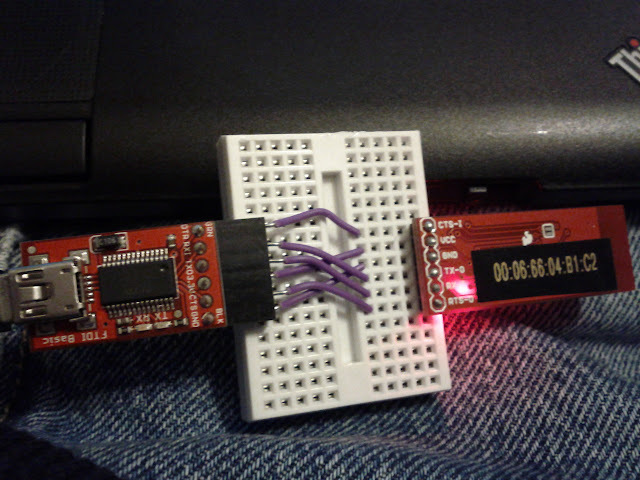 Then I cd'ed into it and ran ./arduino. I tried the http://arduino.cc/en/Tutorial/Blink example, and it worked great. // you can also write ASCII characters in single quotes. // prints value as string as an ASCII-encoded decimal (base 10). // But you can declare the modifier for decimal if you want to.